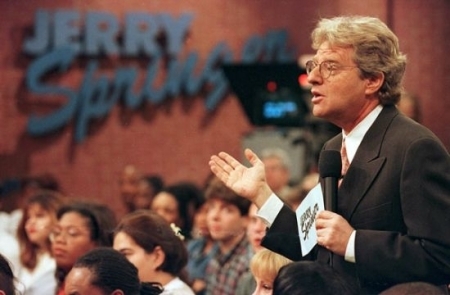 iradiophilly | News - Jerry Springer is NOT dead. Just another car crash hoax. Jerry Springer is NOT dead. Just another car crash hoax. Jerry Springer is NOT dead. He is just the latest in a line of celebrities to get the fake death treatment that easily gets spread over social media including Twitter and Facebook. The story is always the same. It involves “Interstate 80 between Morristown and Roswell”. The fake crash report always claims that the celebrity “lost control while driving a friend’s vehicle”. They are pronounced dead at the scene and drugs and alcohol do not appear to be a factor. They even use the same photo of an overturned car. See Jerry Springer's fake report here. Fans have flooded Twitter with messages like “R.I.P Jerry Springer” and “Is Jerry Springer dead?” Other celebrities who've fallen victim to the fictitious car crash reports include David Guetta, DJ Pauly D, David Beckam, and Vanilla Ice. Why do people create and send out these fake death announcements? Who knows, but they take control of social media for a little while since most people fall for them. Sooner or later they'll turn into a “boy who cried wolf” situation for social media where no one will believe anything they see because of the proliferation of hoaxes, but until then if you saw it on the internet it must be true. The site that hosted Springer's report, swellserver.com aka fakeawish.com, claims to make it easy to launch a hoax. Who knows, maybe your's will cause an internet sensation.